After destroying more than 50% of the original wetlands in the United States, people have finally begun to appreciate the wetlands' functions on this planet. This appreciation has resulted in a growing desire to protect these delicate ecosystems. One of the most common ways to protect wetlands is by setting aside conservation areas where the natural, undisturbed state of wetlands is maintained. Photo: Cattails in Conservation Area II, Florida Everglades. Photo courtesy of South Florida Water Management District. Another way in which wetlands have been protected in the United States is through legislation. In response to growing concerns over the current and projected pollution of U.S. waterways, the legislature passed the Clean Water Act in 1972. A portion of this Act is specifically aimed at the preservation of wetlands and calls for "no overall net loss of the Nation's remaining wetlands base...and...to increase the quality and quantity of the Nation's wetlands, as defined by acreage and function." In an effort to attain the goals set forth in the Clean Water Act, the U.S. government requires developers to obtain a permit from the Army Corps of Engineers prior to disturbing a wetlands area. Frequently, a condition of such a permit is that the developer must create 1.5 acres of wetlands for every 1 acre that is to be disturbed during development. The new wetlands must function at least at the same level of productivity as the ones that are to be disturbed. This goal can be accomplished by restoring the flow of water through a former wetland ecosystem or by creating a wetland ecosystem in a new area. In addition to fulfilling the environmental obligations of permits, properly constructed wetlands will treat wastewater (sewage), acid mine drainage, and agricultural runoff. They will do this by filtering the impurities from the water. In this way, wetlands are like an ecosystem's kidneys. In order to take advantage of this natural and often economical way of cleaning the environment, many people are constructing wetlands near homes without septic systems, near abandoned and operational mines, and near farm feed lots. These constructed wetlands effectively remove many of the impurities, such as excessive nutrients and heavy metals, from the water. Photo: Constructed wetlands being used to treat agricultural runoff on a Department of Agriculture and Marketing farm in Nova Scotia. 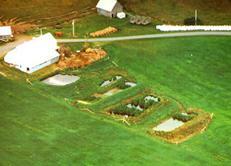 Photo courtesy of Nova Scotia Department of Agriculture and Marketing. The protection of wetlands through preservation, restoration, and creation has many beneficial effects. There is an increase in the amount of habitat available to wetlands species, which ultimately results in increased biodiversity in these areas. The wetlands offer new, economical, and environmentally friendly ways to treat various types of polluted water. Lastly, the wetlands are great locations for ecotourists to visit. Ecotourists can hunt, fish, birdwatch, paint, etc. in these unique areas.